This week we have been using what we know about the Meerkat Mail story to create our own stories (based on the same story structure). We created new characters and began to orally tell our stories. We went on to create story maps for our stories. We also used our language lessons to practise spelling HFWs and using joined up handwriting. In maths, our focus for the week was patterns. Some of the children learned to extend and create their own patterns. 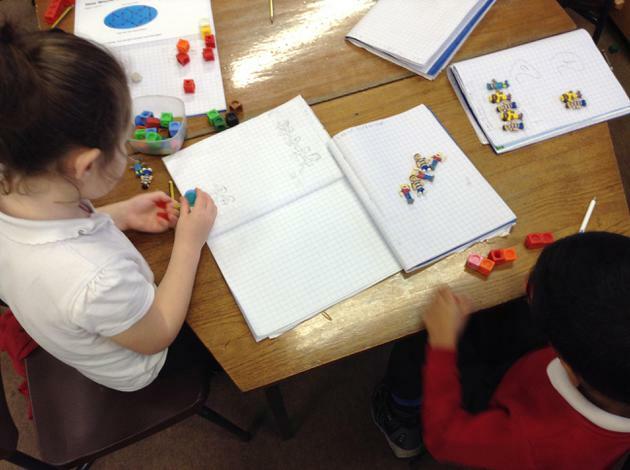 Some children went on to extend, discuss and sort number patterns. They had to think about odd and even numbers, counting in 1s, 2s, 5s and 10s, and also whether the number pattern was counting upwards or backwards. On Monday afternoon we practised sketching so that we could draw life size meerkats for our safari role play area. Afterwards we painted them. They look fantastic! On Wednesday we completed our food chain videos using the Explain Everything app on the iPads. Take a look at them using the link below! In PE we learnt an African dance. The children were fantastic! We were very lucky this week to have 2 special activities. We had the opportunity on Tuesday to go and watch the animated videos that the Year 4/5 class have been making through the Creative Schools Project. Then on Friday we got to go and make some of our own animations with the iMotion app! The videos were fab and we will definitely be doing more animations in class in the future! We've had a very busy week in Dosbarth Moel Siabod! On Monday we received an email from Sunny the meerkat, letting us know that he would be coming to visit. We decided that we didn't know enough about meerkats to look after him properly so we did some research. We found lots of interesting facts in a fact file. We read it with a partner and answered questions. Some of the children also decided that he would need somewhere to sleep and decided to make the class its very own meerkat area, using sand tunnels! In the afternoon we decided to find out where Sunny was travelling from and found that the Kalahari desert is spread over 3 African countries! We marked the countries on our own maps. On Tuesday morning, Sunny arrived! He didn't say much but we could tell that he was tired from his long journey... We decided to make him some welcome flags using what we had learned about halving shapes. Each flag that we designed had to have half of the blocks coloured in. 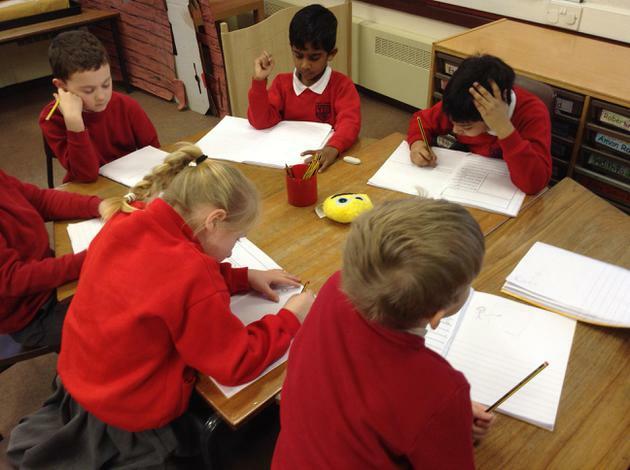 In our literacy lesson, we had a go at writing the beginning of the Meerkat Mail story to show Sunny. 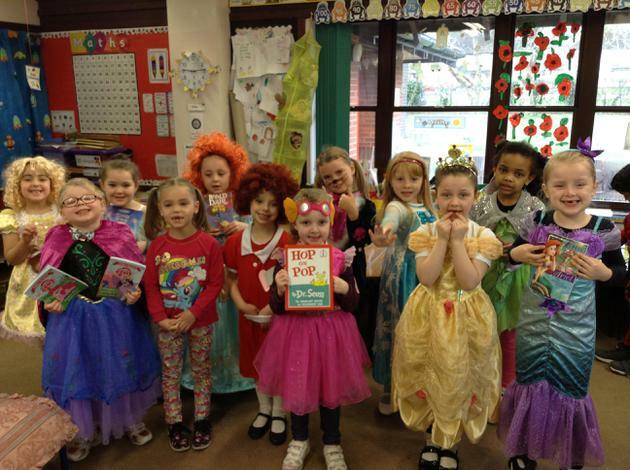 It was also World Book Day on Tuesday! 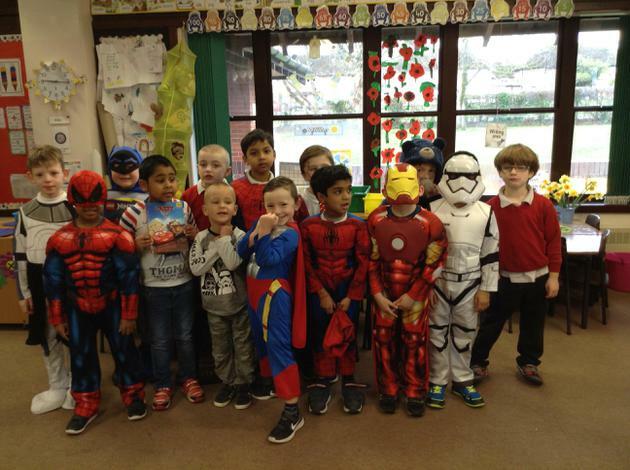 All of the children looked fantastic in their costumes. In the afternoon we designed our own book tokens to enter in a competition, and created our own book marks to take home. Wednesday morning was lots of fun! 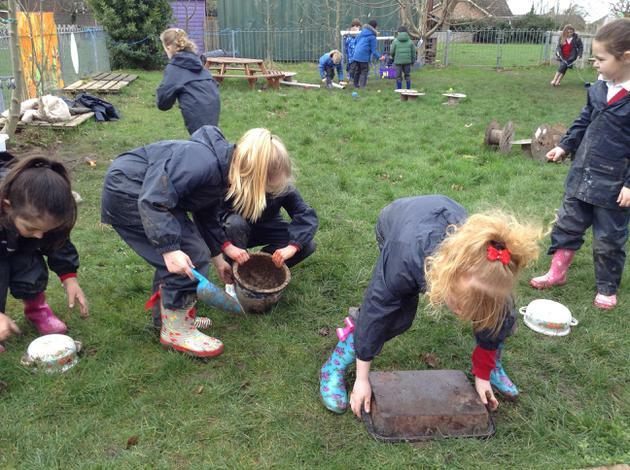 We put our wellies on and went out to our mud kitchen. We made lots of mud pies and cut them into halves and quarters. We went back inside for literacy and wrote descriptions of Sunny, making sure to talk about his personality, appearance, likes and dislikes. In the afternoon, we started to create food chain videos on the iPads, using an app called Explain Everything. We will continue these next week. By Thursday, Miss Cooper felt that we were very confident with fractions so we played games to recap on recognising odd and even numbers. Most of the children were able to recognise odd and even numbers to 100 by the end of the lesson. Da iawn! In literacy, we learnt that ow can make two different sounds (oa and ou). We wrote sentences using ow words. We also practised our joined handwriting. In the afternoon we had the chance to complete some challenges from our challenge charts with help from Miss Cooper. PE this week was a yoga lesson, based on a story about a baby lioness that cannot find her roar. Finally on Friday we played a game where we had to ask mathematical questions to work out a hidden number. In literacy we wrote postcards from Sunny to send home to his family to tell them all about his week in Ysgol y Faenol. 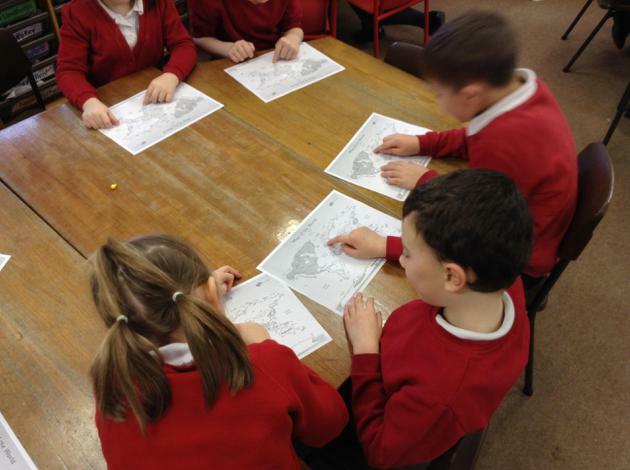 In the afternoon we started to write our animal fact files in Welsh and then had lots of fun playing for Golden Time. Welcome back after half term! We've been very busy this week with lots of celebrations and the start of our new topic. On Monday we wrote about our holiday news. We made sure we used a full stop at the end of each sentence by using rainbow sentences. We used a new colour for each sentence and had to remember to use a full stop before changing colour! In the afternoon we found out what Lent was and discussed what types of things people could give up. On Tuesday morning we looked at Meerkat Mail to start our new topic. We looked at the different problems that Sunny faced and discussed how we could solve them. We also solved some pancake themed money problems. In the afternoon we made pancakes to celebrate Shrove Tuesday. 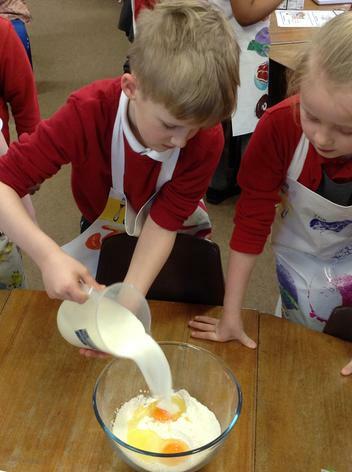 We looked at the recipe and decided that it wouldn't make enough pancakes for us all to share, so we doubled all of the ingredients so that we could make more! Afterwards we chose different toppings to try and tasted the pancakes. They were yummy! On Wednesday it was Saint David's Day. Some of the children came in wearing traditional Welsh outfits. 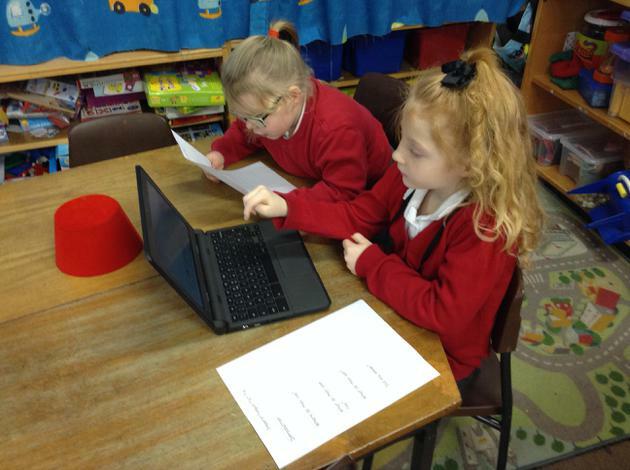 Miss Cooper put our picture on Twitter and the BBC used it on one of their websites! 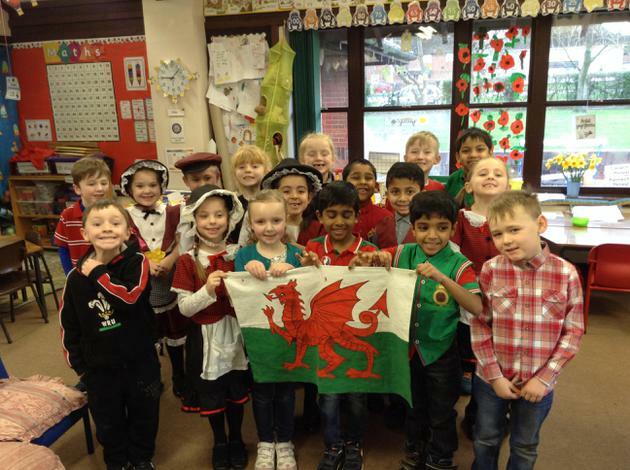 (Take a look here... ) In the morning we had lots of fun singing Welsh songs in our Saint David's Day service and then learning about the story of Saint David. 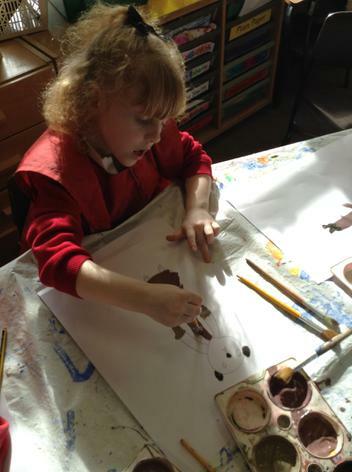 In the afternoon we painted daffodils and wrote recipes for pancakes, using ordering words and bossy verbs. 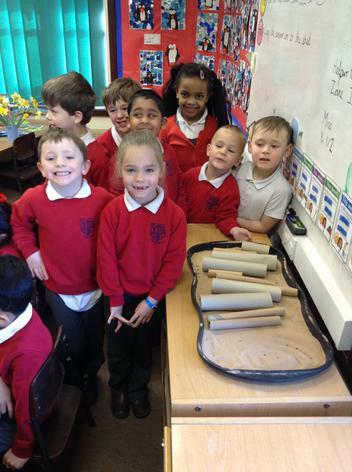 On Thursday we finished writing our pancake recipes and starting learning to tell our class story (Meerkat Mail). We added actions and created a class story map. In the afternoon we used the discussions tool on Hwb+ to share what we already know about Africa and meerkats, and what we would like to find out. Finally, on Friday we looked at some different animals that live in Africa and learnt their Welsh names. We used the animal masks to take part in some Welsh role play. We also looked back at our daffodil diaries and discussed how our class flowers had changed over the week. Our focus in maths this week has been doubling and halving. We are now really good at recalling doubles and halves of numbers to 10/20, from memory. We did lots of practical activities and played lots of games over the week to help us remember them very quickly. Our main project for this week was making our Emperor Penguin Fact Files on the iPads. We used an app called 'Book Creator' and used our research homework to create some fantastic fact files! The children had to work with a partner to decide on how the fact file would be set out, the font type, size and colour. The whole class did very well. They learnt how to use a new app, how to work with a partner and a lot of facts about emperor penguins! I have added some of the completed fact files to our class page. Take a look! Our maths focus for this week was money. The year 1 children practised paying for items costing up to 20p and finding change from 10p. The year 2 children paid for items costing up £1 and giving change from multiples of 10. We did lots of practical activities, including creating a toy shop, finding different ways to make amounts and matching games. By the end of the week we had moved on to two step problems, involving finding totals and working out change. In the afternoons this week, we completed our Starry Night paintings, played bingo in Welsh, took part in a yoga session and role played scenarios in PSE. On Friday we were visited by a penguin to finish off our topic and had lots of fun outside playing with a snow machine! 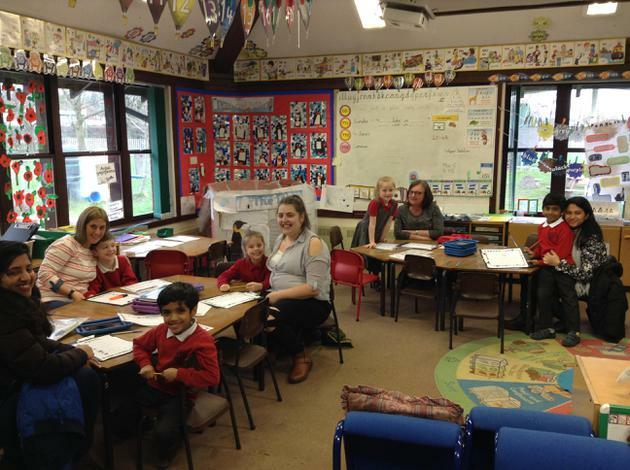 On Friday, we had our second Learning Together workshop for parents of children in Dosbarth Moel Siabod. We had lots of fun completing tally charts and bar graphs on j2e, using Smarties! Thank you to all of the parents that attended. This week we have done a lot of work on time. We have been learning to read o'clock and half past on analogue and digital clocks. Some of the children went on to look at quarter to and quarter past. We all worked really hard and did very well! We continued with our penguins topic by sharing our homework projects and learning lots of facts from each other. We used what we had found out to start planning fact files about Emperor penguins. We filled in any gaps by doing some extra research in class using the iPads and Chromebooks. We also discussed stars this week, as when we first read Lost and Found we decided that the boy and the penguin might have used the stars to help navigate them to the South Pole. We watched a very interesting video clip and recorded our favourite star facts. The class were amazed to find out that the Sun is a star and is made of fire! 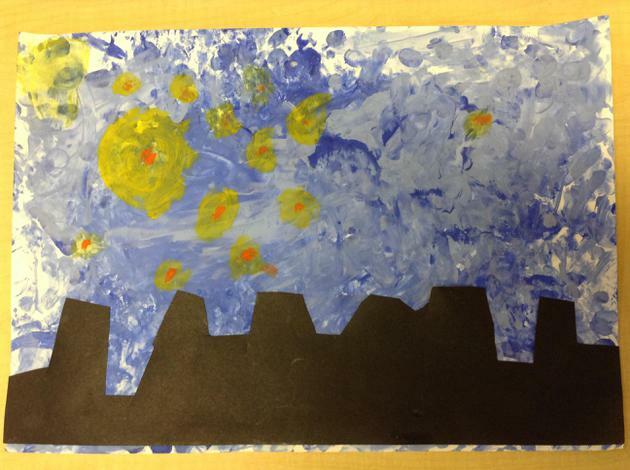 We then looked at Starry Night by Vincent van Gogh and started painting our own interpretations. We will continue these next week. This week we also decided to create a storm song after discussing the penguins journey through the stormy sea. The children split into groups and decided on which instruments they could use to recreate the different sounds you might hear in a storm. Tuesday was Safer Internet Day. We had a good discussion about what the internet is, how we can access it, and the positives/negatives of it. We also talked about staying healthy and making sure that we don't overuse iPads and phones. After that we became internet detectives as we looked at some information that Mizzle the Mouse and Electra the Elephant had posted online. We decided who was being safe online and who was giving out too much information. After such a busy week, we used our PE lesson to take some deep breaths and calm down! 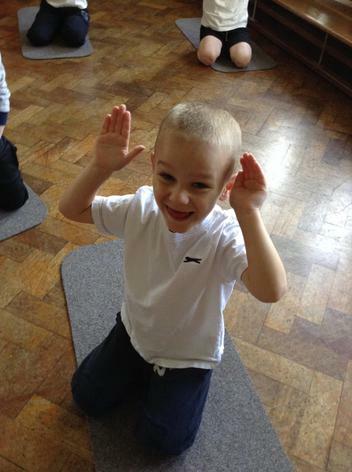 We took part in a yoga lesson and practised lots of new moves. The children were fantastic! On Friday morning a group of parents and grandparents came in to take part in a Learning Together workshop. We started our session outside hunting for minibeast QR codes. We used the iPads to scan the QR codes and recorded what we found in a table. Back inside we discussed the minibeasts and came up with lots of adjectives to describe them. We finished the session by writing poems about minibeasts using similes. Well done to all the children and a big thank you to the parents and grandparents that were able to take part! This week we had two celebrations to learn about. First we found out about Santes Dwynwen (the Welsh patron saint of love). We read her story and created love hearts to give to people that we care about. We wrote a message in Welsh in the middle of the hearts. We also looked at Chinese New Year which is due to be celebrated on Saturday. We read the story of the Chinese zodiac and watched a video to find out how some people might celebrate. We also then read a Chinese New Year fact file and answered some questions (using the text to help us out!) We decided that we would like to make an instrument that we saw on the video. So we worked in partners to read instructions and created our own Chinese paper drums. In PE we created our own Chinese New Year dances, and even tried out some lion dancing with a partner. In literacy lessons we began to create our own Lost and Found stories, based on the one by Oliver Jeffers. We created new characters and told our new stories to a friend. We began to write our beginning sections and then edited them before putting it in to our best books. The children have made a fantastic start! In phonics we practised reading words with the various spellings of the ie sound. In handwriting we continued to practise writing full words using joined handwriting. The children have been asked to now use cursive handwriting at all times in all lessons! In maths lessons we have done lots of problem solving activities, linked to addition and subtraction. We started off by using house cards to help us find missing numbers in addition and subtraction stories. E.g. 4 + ? = 10. On Thursday we talked about the link between addition and subtraction. We had to look at house cards and write all of the addition and subtraction stories we could, using only the given numbers. Finally, we put everything to use whilst trying to solve addition and subtraction word problems. We spent a lot of time this week thinking about journeys. We found Wales and the South Pole on a globe and thought about the journey that we would have to take if we went in a rowing boat. We worked in pairs to plan a route. We then went on to discuss the different countries that we could visit on the way and wrote a list of all the things that we would need to pack. Some of the children decided that they would need very big suitcases to pack everything that they wanted to take! We also started to plan for a debate that we are going to be having about the best type of transport to use to get to the South Pole. Finally we watched a video clip of Antarctica and wrote postcard home to describe what it's like using similes to make our descriptions more interesting. In maths we have been doing lots of problem solving this week! We decided to try a different technique to solve a particular problem and worked on it for three days worth of maths lessons! We also learnt about doubling and halving numbers (to 10 for yr1 and to 99 for yr 2). The Year 1 children began by using cubes and counters to help them, but by the end of the week many of the children could recall them from memory. The Year 2 children learnt how to double and half two digit numbers using partitioning. This was very tricky and some of the children will revisit it next week. 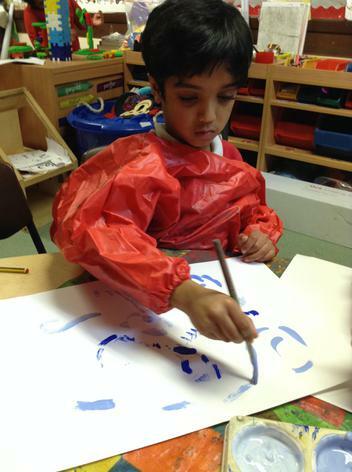 The children have all enjoyed a craft activity this week. 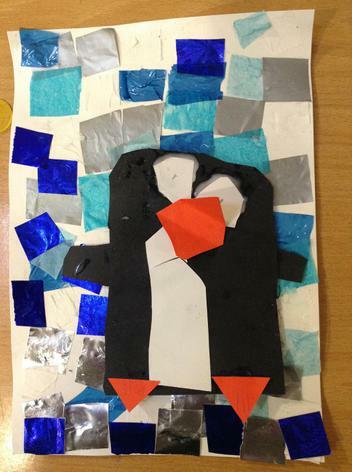 We started by collaging a background scene using cold colours and then went on to create a penguin to glue on top. The children have worked very hard and the work will be used to create a display in class. In PE we continued with hockey and practised using a hockey stick to manoeuvre a ball around cones. On Friday morning, PC John came to visit and taught us all about dangerous objects that we might find in and around our homes, such as medicines, matches and needles. We learnt three very important words - DON'T TOUCH, TELL! This week we continued to get to know the story of 'Lost and Found'. We worked as a class to draw a story map and add our own actions to it (to help us remember the sequence when we perform it). We then went on to 'have a go' at writing the story with out any help. The next day we were discussing the story and found that if the boy had just spoke to the penguin he might have saved himself a trip to the South Pole! We added speech bubbles and dialogue in speech marks to the story. On Tuesday afternoon we wanted to find out which animals live in the Arctic and which live in Antarctica. We started our research on Hwb and then used the iPads with a partner to find pictures of the different animals. 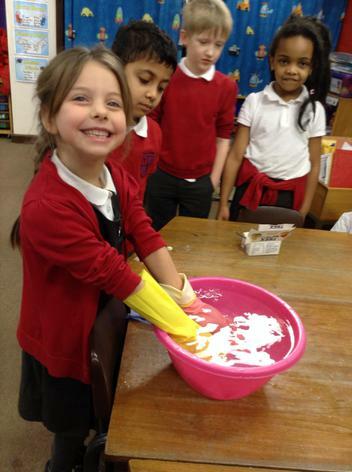 We had lots of questions about how the animals that spend a lot of time in the water stayed warm, so on Wednesday we did the 'Blubber Glove Investigation'. The children loved this and it was definitely the favourite activity of the week! We had to fill a large glove with vegetable fat and then put a gloved hand inside it. We then dipped it in ice water and compared how it felt to our hand without the 'blubber'! We had some great discussions about temperature and different ways to measure time. We all decided that the blubber was a very good way for penguins to stay warm in the freezing water! The children went on to write investigation reports explaining what we had done and what we found out. Our maths focus for the week was comparing and ordering numbers to 100, and partitioning 2 digit numbers in to tens and units. On Monday and Tuesday we played games on the iPads where we had to order non consecutive numbers forwards and backwards. Most of us have gotten very good at this and some of the children even went on to order numbers to 999! We also looked at comparing numbers by saying which is the smallest and which is the largest. On Wednesday and Thursday we focused on place value. We played games where we had to match 2 digit numbers to their tens and units description, and we even became number detectives at one point! On Friday we did a problem solving activity where we had to look at a set of dots and describe to a friend how we counted them. This was very interesting as the children had very different ideas to each other! In Welsh we asked the questions 'Ble mae'r pengwin?' and responded using positional language, e.g. Mae pengwin yn y bocs. In PE we continued learning some new hockey skills and focused on controlling a ball with a hockey stick. In RE we listened to two Jewish stories and discussed how we think Jewish people feel about God. In the quiet moments in between all of this (!) we also learned the cursive formation for v and w, the alternative igh spelling of the ie sound, and practised spelling HFWs. The children have had lots to tell me about their Christmas holidays and have settled back in to the school routine really well. We've started our new topic this week, 'On the Move', with a focus on 'Lost and Found' by Oliver Jeffers for this half term. On Wednesday morning we had a special delivery from the postman, and after some predictions, we opened up the parcel to find a penguin with our new book. We spent some time describing him and learned how to use similes to make our descriptions more exciting. We then went on to create FOUND posters. On Thursday and Friday we edited our work and produced our final copies. The work that the children produced was fantastic and they should be very proud of themselves! In maths this week we have looked at numbers to 100. On Thursday we practised estimating how many objects there were on a plate and then counted them accurately by grouping them in to sets of 2. On Friday we played bingo to see if we all recognised numbers up to 20 and 100. We moved on to practise correct number formation and orientation, and then reading number words. For PSE we worked with Mrs Hough to discuss what it means to be a 'good learner' and after reading a letter from an alien (who would like to set up a school) we decided to make labelled posters to show them what a good learner is. On Thursday afternoon we had a teamwork challenge where we had to build an igloo for a character from our story, using only sugar cubes. We had to work together to find a way to balance the sugar cubes so that the igloo had a roof! The children really enjoyed this challenge and have decided they would like to carry it on next week in the Challenge Zone. In PE this week we started to learn about hockey. We practised holding the hockey stick correctly and using it to move balls around the yard. Unfortunately a number of the children could not join in as they didn't have their PE kits in school. Please ensure your child's PE kit is in school everyday. For Golden Time this week Tony brought in his Lost and Found DVD for us all to watch. Thank you very much Tony!